Captured Rebel Encampment. Timothy O'Sullivan, June 1864. Library of Congress cw00382. 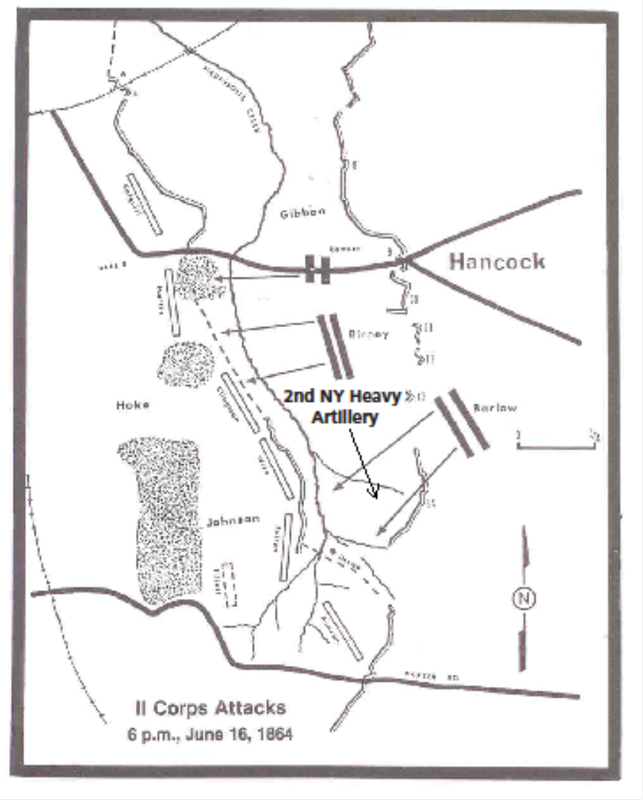 At 5 P. M., on the 16th, the brigade was ordered to the support of the 2d Corps, engaged in an assault on the left of the line. The 97th P. V. reached its destination about 9 P. M., in time to support the advance made by Hancock's troops, and relieved a force that had driven the enemy about half a mile through the woods, across ravines and gullies to a point near an old rebel camp of log huts. It was requisite to move cautiously and avoid any exposure, as the enemy was in close proximity to our position in a strong line of intrenchments. The remainder of the night was spent in reversing and strengthening the works captured. This was accomplished under a heavy fire, but the Regiment escaped without casualties. We don't know exactly where the deserted Confederate camp was located, but there are hints in the description. Stay tuned for more on this.